With a flick of a switch from your keychain remote, turn the flames on or off for this new gas fire pit insert. 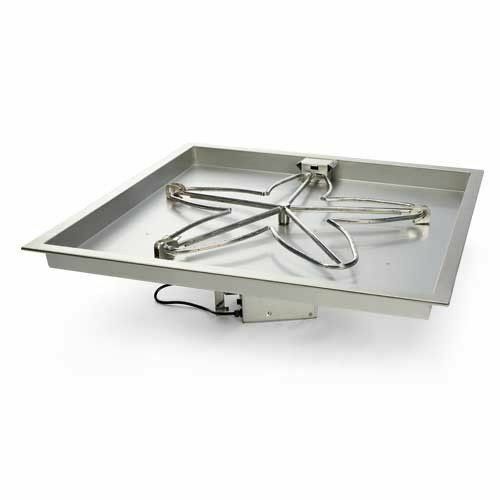 Made from the best quality materials, including #304, 18-gauge stainless steel, this 18" square fire pit insert comes exclusively with welded gas fittings for structural support and a raised hub burner with built-in drainage holes to prevent corrosion and water damage. Situated in a 2.5" pan with a 1.3" pan lip for support, this 12" star-shaped recess burner can emit a maximum of 65k BTUs, bringing a glimmering shine of ambiance to any occasion. Offering over 120vac of direct power, it may be necessary to purchase a power-transformer for accessories requiring 24vac power, such as timers and emergency stop keys. Some additional items sold separately include a vinyl cover, lava rocks, or glass chips.